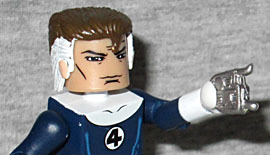 Reed Richards leads the Fantastic Four, each whom was given strange powers by cosmic rays. A brilliant scientist, Richards can also stretch his body into any shape. Yes he can! 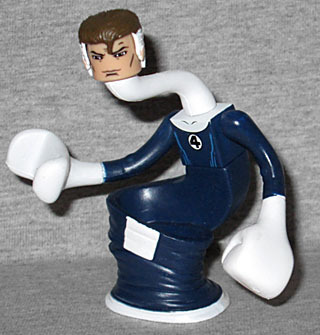 And this figure offers more new pieces to show how he can do that than any Reed before him: there's the stretchy legs and the inflated fist that the Super Skrull came with, but also a stretched out right arm that ends in a big clamp that can hold a standard Minimate torso, and a stretchy neck. It reminds me of Dr. Impossible from Venture Bros. (before Stephen Colbert got too big to voice him any more): "try to beat up a man of living rubber!" If you want him to look more normal, the set includes standard Minimate arms and legs. And a clear disc base to keep him standing if you want to give him one of the weird arms (which would otherwise unbalance him). Be warned that the stretch-neck peg is slightly larger than the normal neck peg, so when you initially put the head back on the chest, it will be loose until the plastic "relaxes." But the coolest part is the little silver device included in the lower tray. It's the Ultimate Nullifier, the extraterrestrial weapon that even Galactus is afraid of! It's very difficult to get the thing into a Minimate hand, but the size is good enough for either 4" or 6" figures to hold it, if you want. With his radioactive clay, Phillip Masters can control the actions of others by making and manipulating small puppets. He has controlled the FF on numerous occasions. Wow, I never made the connection until now that the guy's supranym is Puppet Master and his real last name is "Masters." I'm dumb. And he's creepy. 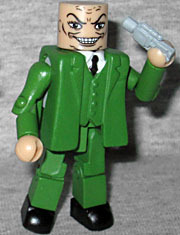 When Jack Kirby designed Puppet Master, he made him look like a ventriloquist's dummy, with weird, doll-like eyelashes; smooth, arching eyebrows; and an inhuman mouth (all features that this Minimate retains). He's wearing a dark green apron, and thick brown-red gloves. If you want a more casual look for your terror-faced kidnapper, he includes replacement arms and a green suit jacket that's been borrowed from his fellow bald mentalist, Professor X. 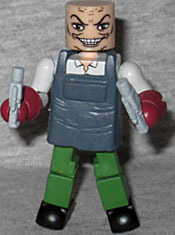 The set also includes two very cool accessories: tiny Minimate puppets! They're solid gray, and have no details other than what a plain Minimate body would have, but they're really neat. We are important! We control the future! This entry was posted in Art Asylum, Marvel, MMMR and tagged Fantastic Four, Minimates. Bookmark the permalink.